On Jan. 17, the Ontario government announced changes to the current Ontario Student Assistance Program (OSAP) and some students aren’t happy. The government stated that the new OSAP changes will be more efficient in helping low-income students afford tuition. However, students have taken to social media in response to state that changes to OSAP will ultimately create greater difficulty for students paying off their loans. Last Friday, the Canadian Federation of Students Ontario held a rally in Queen’s Park to protest the new OSAP regulations. One change students have voiced grave concern with is the removal of the six-month interest-free grace period. By removing this grace period, interest on student loans will be charged the second students graduate. 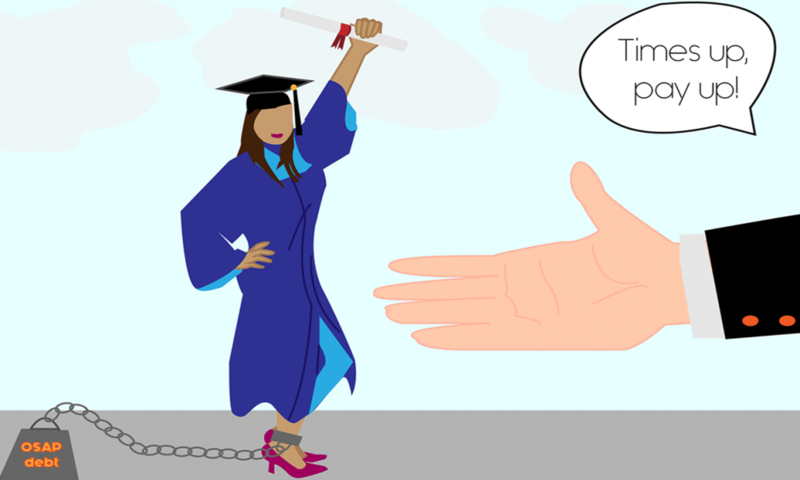 Taking away time from students to pay off their loans, interest free, is going to affect student financial stability once they enter the workforce. In what appears to be an attempt to deflect attention from an uproar of angry students, Ontario Premier Doug Ford announced a 10 per cent tuition cut for the 2019-2020 academic year. Marcus Mattinson, director of communications for the Progressive Conservative government expressed excitement over the changes, stating that the 10 per cent tuition cut will allow students to save by an average of $660 to $1,000. The Ontario government website states that the changes to OSAP will help around 210,000 Ontario undergraduate students pay tuition. But some students who qualified for free tuition this semester will be in a different situation come September, since eligibility for the grant is now only for families earning $50,000 or less. This means students are going to be forced to take out more loans, adding to their student debt. The 10 per cent tuition cut also doesn’t apply to international students. This could result in schools in Ontario no longer being in competition for international students to come study. Ford has done a great job giving the public mixed signals by only addressing the 10 per cent tuition cut and confusing students with numbers of how much they could save. Even with the 10 per cent tuition cut some universities and colleges, including Ryerson, will have to decrease their total annual budget to be able to adhere to it. Schools could cut programs and student facilities to make up the loss of income from tuition. On Jan. 18 Ryerson’s president Mohamed Lachemi made a statement that Ryerson’s total operating budget will see a reduction of a five per cent due to the tuition cuts. As well, students can now opt out of paying non-essential fees (ancillary fees), according to The Globe and Mail. However, these fees help fund student clubs, unions and things like free academic support, student counselling and possibly Ryerson’s dental plan. For Ryerson students, the future is unclear. But there is no question that cuts to Ryerson’s budget will affect students and campus life. While some of the changes seem beneficial, the majority actually negatively impact students’ ability in continuing postsecondary and their financial stability in the future.